Can you share a bit about your journey to becoming a writer/published author? Was it a dream from childhood or something you embraced at a later age? My decision to learn the Italian language ultimately led to my writing career so that I could incorporate my love for Italy and my passion for art history first through my blog and now in fictional form to engage more readers. I have always considered myself an artist and writer. When I was little, I used to write fanciful stories, and I kept lots of personal diaries. From the age of 10 or so, I also kept loads of sketchbooks in which I drew everything I saw. In college, I began gravitating more and more toward a career in the arts and I studied both painting and Art history in Florence. I went to Italy primarily because of my passion for the arts, but wasn’t all that interested in learning the language. Upon completion of Grad School with a Masters in Art History I thought about teaching but decided instead to become a graphic designer and for years have run my own firm. Over time, however, I began to miss Italy very much and regretted not having learned the language well. So, I started focusing on becoming fluent. A few years after that decision, I decided to combine my graphic skills, my Italian language skills and my writing skills and began the Studentessa Matta blog where I write in Italian and English to promote the study of language and culture. The blog is mostly composed of non-fiction articles, and I write about everything from language learning tips to Italian music to interesting Italian festivals and holidays. After starting my blog seven years ago, it took another couple of years, but then I got the crazy idea to go a step further and write a novel. Since publishing my first novel “Dreaming Sophia” I've been hooked on writing novels. I love creating worlds and inventing people to populate them. I find it to be a very creative process, not only through writing but also in the design of the books together as well. I illustrate my covers and layout my book interiors. 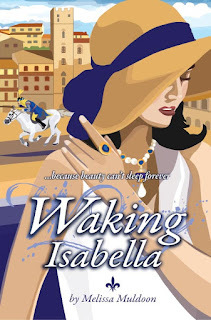 Where did the inspiration for the storyline in Waking Isabella come from? 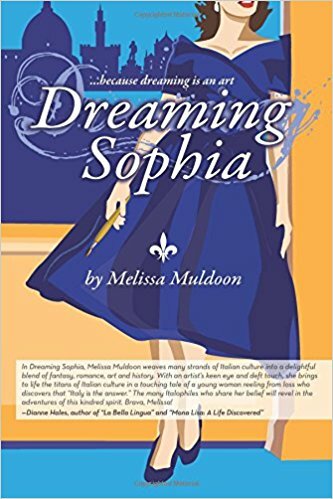 After finishing my debut novel "Dreaming Sophia" which in some ways is autobiographical and tells the story of a young woman – an artist and how she ends up in Florence Italy – I knew I wanted to write another story. In the first book, my protagonist Sophia meets important personalities from Italy's history – poets, writers, movie stars, and artists – in her daydreams. For my second book "Waking Isabella," again I wanted to explore art and historical themes but also wanted the story to involve a bit of a mystery as well. As I have recently been spending a lot of time in Arezzo Italy, a small hill town in Tuscany leading small group language immersion programs I thought it would be a perfect setting. Not only could I take the reader to a city, not many people have heard of, but I could tell them about Arezzo's unique jousting festival, antique fair as well the city’s traditions and a bit of its history. 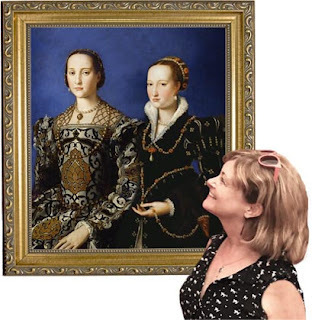 What pulled the entire story together for me, however, was an encounter I had with Isabella de' Medici's portrait that I ran into one day a museum in Arezzo. I was intrigued by the look in the Medici Princesses' eyes, and when I started doing a bit of research about her, I knew Isabella would be a perfect character to create a story around. How about the inspiration for the people we meet in this? Can we find parts of you in the main female characters of Nora or Isabella? I think all writers put a bit of themselves in their characters. At the beginning of the story, Nora is a bit depressed and longs to know if she has made the right choices and wonders about the life she didn't choose. I think we can all relate to that feeling and wonder about the experiences we might have had if we had studied something different, selected a job in another city, taken that trip we turned down, lived in another country, been braver and tried something that scared us, or perhaps even married a different person. But I think the real message is: it is never too late. We can follow our dreams and our hearts and take chances. We can always make a new decision or choice that will change the course of our lives. We don’t have to settle for ordinary. I certainly changed my own game plan and the direction of my life based on my decision to learn Italian! As for Isabella and Margherita, I’m quite drawn to both these characters and had a lot of fun writing their scenes. I think they must have been quite a remarkable women and I admire them for standing out, daring to take risks, being an independent women and a non-conformists. I would like to think I have some of those qualities too. This book starts in the distant past, then continues in the future with flashbacks occurring occasionally. How hard was it to keep track of the 2 parallel history lines and to blend them smoothly into one story? I like to incorporate scenes from the past because it is what fascinates me the most about fiction writing. But I think to keep a contemporary reader onboard with the story it is also necessary to create a modern protagonist. In my first novel "Dreaming Sophia" I used Sophia's daydreams as a means for her to dip back in time and visit with characters from a different period. In "Waking Isabella," I use the fact that Nora is an empath and very sensitive to the feelings of others as the vehicle through which she can channel thoughts and feelings not only of those around her, but also the energy of personalities from a previous eras. In “Waking Isabella” it was necessary for the reader get to know Isabella's character personally, so that they would have a greater appreciation for the story or her missing painting in the twentieth-century and why it was important for Nora to find it and bring her back to life. It was also necessary to develop Margherita's character and her storyline as it was essential to understanding how and why the painting went missing in the first place. For me, it wasn't hard to jump back in time and let the voices of Margherita and Isabella chime in throughout the book. As I wrote, I could well imagine what they had to say! In fact, I had the most fun writing the scenes that take place in the fifteenth-century and those that took place in the 1940s during WWII. How do you organize your time when working on a new book - daily writing time, when inspiration strikes or ? When I begin to write a novel, it is an all-consuming process. Sometimes I start early in the morning and write all day long and well into the night. I work all week long and also on the weekends. It never stops. I get entirely drawn into the plot the characters and envisioning the scenes and making sure everything is hanging together. I begin with a well-detailed outline. Before that I work for several months reading books, watching films, and doing research on everything from the kind of hat that was worn in 1940 to emailing a jouster in Arezzo and asking detailed questions about the rules of the game. Once I have started writing and have my first draft, I begin all over again, filling in conversations and refining details and enhancing scenes. When I'm doing other things during the day like working, answering emails and writing articles for my blog, or when I think I am relaxing, listening to music or walking the dogs at night, I'm still always thinking about the story line. Often I will abruptly drop what I'm doing to write things down or work on a dialogue or add some detail to a scene. I have also been known to wake up from in the middle of the night and jump up and turn on the computer and start writing because something has come to me that I need to get down. It's an addictive, invigorating, frustrating and a joyful process to say the least. What kind of research was necessary to keep the places and historical references in Waking Isabella as accurate as possible? It was essential to research Isabella de' Medici well. I wanted the reader to come to understand and appreciate her as I had. So, I read many books about her. I also visited Cerreto Guidi in Italy where she was murdered. I, like the character Nora in "Waking Isabella," had a delightful conversation with the museum guard about Isabella. I wanted the story to be accurate, but there are a few places where I took a few liberties, and at the end of the story I make some notations where I fabricated a few things. For the most part, however, to the best of my knowledge events played out as I have written them. It was also imperative to me that the reader has a sense of events that occurred during the World War II years. Often, these injustices and tragedies aren't as evident, but just the same intolerable. And then there are those days where it feels like you are pulling teeth, none of your characters want to cooperate with you. You write for an hour and think you have perfected a scene. And then you look back, and it isn't the way you saw it in your head, and you swear the words began to jump around on the page and re-write themselves (not to your liking) when your back was turned, and you were making more coffee. I think book two (Waking Isabella) was much easier to write. Book one (Dreaming Sophia) was super personal. I was riding a wave of ideas and let the writing take me where it wanted me to go, which it turned out was a bit of a circuitous route and I re-wrote and re-edited the story for many months. But, it was a good thing and wasn’t time wasted. The story evolved and matured as it was supposed to and in the process I learned a lot — not only about the process of writing, editing and developing a story but also the design and production of a novel and how to self-publish. After blazing my own trail I had a lot of knowledge in my head, and I couldn't let it go to waste so decided to begin right away with a second book. So, "Waking Isabella," even though it involved a mystery — that required more research and finesse to explain it clearly to an audience who perhaps isn't knowledgeable about the time periods, settings, the town of Arezzo and its traditions as well as the challenges faced by the diverse group of characters — from the beginning followed a more straightforward progression from start to finish, and I had a clearer idea of how the story was going to play out. When you're not working at work or writing a new book, what do you like to do to relax? I like speaking in Italian! I love grabbing a coffee and chatting away with my Italian friends and hosting Italian meetup groups. I live in a little Italian world of my own making here in San Francisco. I listen to Italian music, watch Italian films, read Italian books. And when I'm not working on a book or writing articles for my blog, I'm illustrating, drawing, and painting. And when I'm not doing that, I'm traveling in Italy. I organize small groups to learn the language and this year I will spend two months in Italy in Montepulciano in the spring, and I return to Arezzo for the June joust and again in September. As I was completing "Waking Isabella" a new idea for a novel came to me. I like the way the first two books developed with contemporary protagonists and the stories of how they make their way to Italy as well as developing art and historical themes to pull the contemporary stories together. I want readers to know that art can “talk” to them if they take the time to listen. So, in this tradition, I am working on a third book that will be called "Avenging Artemisia" which will focus on the story of the first important female artist – Artemisia Gentileschi – who flourished during the Baroque period and she too will be paired with a contemporary protagonist and the story will involve a bit of time travel. Interestingly enough, as in the first two books, the Medici family in Florence will also play a part. This coming year you will also find me in Italy in June in Montepulciano with my language group and after that in Arezzo where I will be promoting “Waking Isabella” in the town where the story takes place. I look forward to participating also in the June joust that occurs at night. Then in September I will return again to Arezzo for my fall language program and of course the fall joust. I am a fan after all! You can also find me on the StudentessaMatta.com blog writing about Italy and language learning.